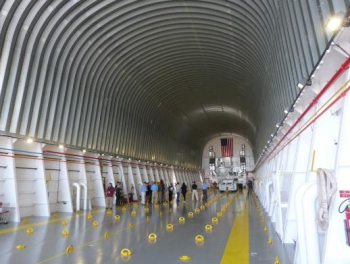 NASA is getting ready to apply spray-on foam insulation (SOFI) to the outside of the Launch Vehicle Stage Adapter (LVSA) that will fly as a part of the Space Launch System (SLS) launch vehicle on Exploration Mission-1 (EM-1). 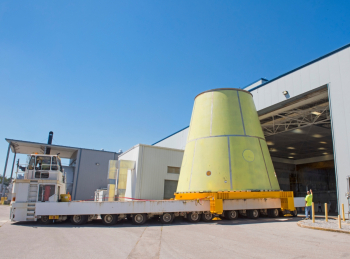 The LVSA is a roughly thirty feet by thirty feet conical spacer structure that connects the top of the SLS Core Stage with the Interim Cryogenic Propulsion System (ICPS) upper stage that will fly on EM-1. 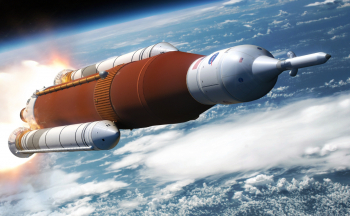 Built by NASA and prime contractor Teledyne Brown Engineering, the LVSA will shortly begin preparations at the National Center for Advanced Manufacturing in Building 4707 at the Marshall Space Flight Center (MSFC) in Huntsville, Alabama, for a few months of foam application work. Following some additional work at Marshall, the LVSA will be shipped to the Kennedy Space Center (KSC) in Florida next year. 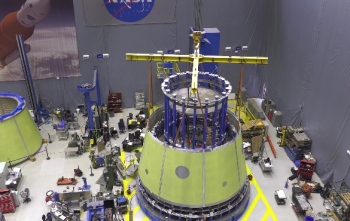 The flight article is the second unit completed; the first unit, a structural test article, was used in integrated structural tests at Marshall this year with the other elements that connect the Orion spacecraft with the ICPS and the SLS. In Building 4707 at Marshall, a clean area is ready for the foam application work to take place. NASA and Teledyne Brown recently completed major welding of the LVSA at the Advanced Weld Facility at Marshall. The structure is primarily made up of sixteen 2195 aluminum alloy panels. Due to its dimensions, the adapter had to first be welded into two cones, forward and aft, which were then welded to complete the structure. “I don’t have a tool that can get twenty-eight feet tall,” Street added. 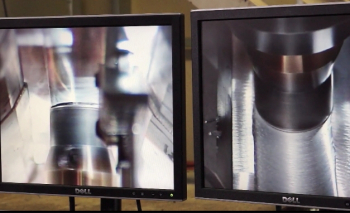 “We build the forward cone first with vertical welds and there are eight of them. It takes about five weeks to do it. Basically what we do is we weld up seven of the joints and then we have to measure it to figure out the final arc length for the top and bottom that we need to do to maintain a cone. The panels were welded using conventional friction stir welding, while the circumferential welds of the rings to the top and bottom used self-reacting friction stir welding. The rings at the top and the bottom of the adapter, also called flanges, are structural attach points to other parts of the launch vehicle. The bottom flange is essentially identical to the flanges that will be on the Core Stage elements and will be bolted to the top flange of the Forward Skirt during vehicle integration in the Vehicle Assembly Building at the Kennedy Space Center in Florida. The adapter’s top flange will attach with a frangible joint assembly to the ICPS. During flight, the Orion-ICPS stack will separate from the Core Stage at the LVSA top flange, with the LVSA remaining attached to the Core Stage. Unlike the static testing of the STA done on the ground, the flight unit needs thermal protection from the atmospheric heating it will see during ascent, so it received a coat of primer in preparation for applying spray-on foam insulation on top of that. Once work begins, the first task is to prepare the surface, beginning with cleaning. “The first thing that we’ll do is a solvent wipe. We’ll wipe down the whole hardware with a…cleaner that we use for these substrates,” Michael Frazier, branch chief for the Non-Metallic Materials Division in Marshall’s Materials and Processes Lab added. Next, the weld lands where the panels were joined together side-by-side and top-to-bottom will be painted with primer. “The panels came pre-primed and then we’ll just fill in the weld lands,” Amy Buck, thermal protection system expert in Marshall’s Materials and Processes Lab, said. “We will roll that material on with just paint rollers — that’s why we tried to minimize the area that we had to do. The type of spray-on foam used on the LVSA will be manual spray. Although similar in chemistry, each of the three foam application processes used on SLS hardware has its own formulation. Besides the manual spray foam, there is a robotically-sprayed foam (also called “auto spray”) that is used at the Michoud Assembly Facility in New Orleans on the barrels of the large Core Stage propellant tanks, and a pour foam that is used for hardware with more complex shapes, like Core Stage propellant feedlines and valves. The manual spray foam was chosen for the LVSA for a few reasons. “This manual spray foam that we have here is more robust as far as the temperatures and humidities that you can apply it in,” Frazier added. “We can apply that at room temperature. 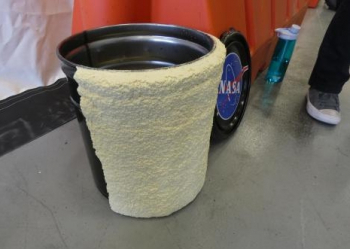 The robotically-applied foam that goes on the [Core Stage propellant] tanks [requires] a temperature and humidity controlled booth to do that operation. 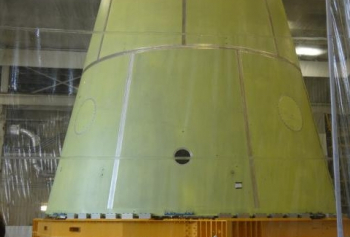 Additionally, since the SLS Block 1 vehicle is only planned to be flown once, producing this stage adapter is a “one-off” job, as is the foaming operation for it. The sprays will be done by hand; two technicians standing up on a lift will alternate using a hand-held spray gun. The materials will stay on the ground with hoses for each running up to the gun where they are combined. “It will be one spray gun, two guys operating one gun,” Buck explained. 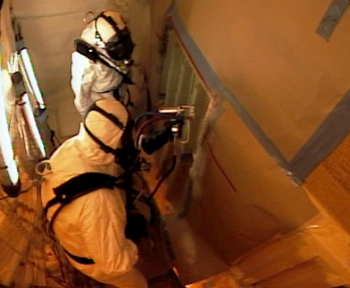 The team has been practicing for the work by spraying on a test panel. “We have one of the panels — one sixteenth of the full article — over in our other development facility and we’ve been spraying on it so that we can get everything right,” she explained. “We’re spraying the whole acreage and then down here where this ramp is, where it goes towards the [bottom] flange, we will actually spray part of that, too. For the LVSA, the technicians will spray alternating strips on one panel at a time. “We’re actually going to alternate a space over so we don’t get overspray onto the article next to it. And then after we do those sixteen alternating sprays, then we’ll come back and do the ones that are in between. As they build up the foam, they will use a tool to measure until they reach the specified thickness. The work is planned to take a few months. Like house painting, most of the time involved is getting set up to do a spray. After the foam application is complete, the LVSA will be moved to another area for additional work. Nettles said the barge trip for the adapter from Marshall to Kennedy is currently planned for the summer of next year. The LVSA will eventually take its place on the rocket in the VAB at Kennedy, when it is stacked on the Core Stage. It will be lifted up into High Bay 3 and positioned on top of the Forward Skirt, where workers on an elevated platform on Level E will install 360 bolts around the circumference where the flanges on the two pieces meet. 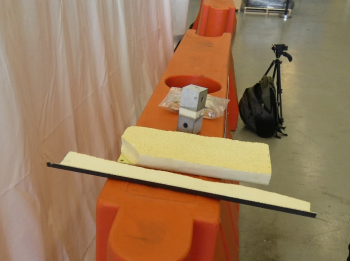 The same type of manually sprayed foam will then be used to “closeout” the bolted flanges. 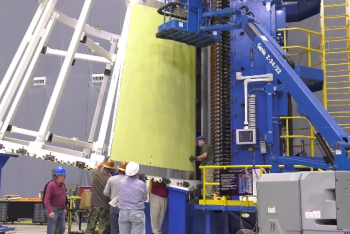 Some time later, the ICPS will be lifted into the High Bay 3 integration cell and attached to the frangible joint assembly on the top of the LVSA.